Quintessence of Dust: Can someone make me a new gene? How is this even possible? Is this even possible? There are a few ways to get a new gene into a human genome. (All of these mechanisms apply to any animal or plant genome, and most occur in all genomes we know). Here are the ones I can think of. 1. Magic. No further comment on this one, but we can't formally rule it out. 1a. Technological "magic." Actually, making a "new gene" in the lab is technologically trivial, and installing such new genes in human genomes is readily achievable. Both 1 and 1a involve the appearance of a new gene "from nowhere," meaning that the gene could appear in a genome with no discernible source. As we will see in the Arhgap11b story, that new gene didn't come from nowhere. In any case, let's ignore 1a for now. 2. Mutation. This seems the obvious answer, and it's not wrong, but it doesn't provide a complete explanation. A very simple mutation in FoxP2 gave us the human-specific version of that gene, and maybe that was a world-changing event, but it didn't make a "new gene." So if mutation is going to generate new genes, it must be some special kind of mutation. 3. Gene transfer from another species. This is known to happen all the time in bacteria, and we know it can happen in mammals like us (viruses are a known source of new genetic material). But it doesn't meet our criteria, since we are looking for something new in all of life, not just new to humans. 4. Duplication of an existing gene (whole or in part). This process is very common, and it is largely responsible for a form of genetic variation—copy number variation, or CNV—that is much more important in human genetics than is commonly recognized. But this also fails to meet our criteria. Gene duplication does explain a lot of evolutionary change, but by definition it can't explain something completely new, at least not by itself. 5. Chunks of DNA hopping around in the genome. This also happens all the time; in fact, the human genome (like genomes of all animals) is teeming with "jumping genes" that generally wreak havoc but occasionally create the opportunity for the generation of a new protein-making gene. But if it's just a piece of DNA relocating, how can it create something new? The details are for another post, but the basic summary is that while the hopping or copying itself doesn't really create anything other than a new context, sometimes the new combination can function as a gene. 6. Rearrangement of DNA in the genome. This kind of shuffling is also known to happen all the time. It's different from the activity of "jumping genes," which are well-defined mobile elements that actually specialize in hopping around. Rearrangements usually result from some kind of structural damage to the genome, and typically involve large pieces of DNA. Whole sections of the genome can be inadvertently deleted, or duplicated, or chopped off of one chromosome and stitched onto another (translocation), or lopped off then flipped backwards and stitched back on (inversion). These changes create new contexts for DNA sequences, and that can create opportunities for a new gene to be born. I think that is the complete toolkit that can be used to create a new protein-coding gene overnight. I'm ignoring magic (and so should you), and we can see that gene duplication and gene transfer by themselves don't do what we want. There are really just three kinds of change that can get it done. All three are mutations that change how the DNA sequence that's already there gets decoded into protein. They are: 1) tiny mutations that shift the reading frame; 2) tiny mutations that change splicing; and 3) large-ish rearrangements that create new combinations of code. How these things actually work is for the next post. But if you know what "reading frame" means, and what splicing is, then you can readily see how a small change can result in a completely different protein sequence. Image: Creation of Eve. 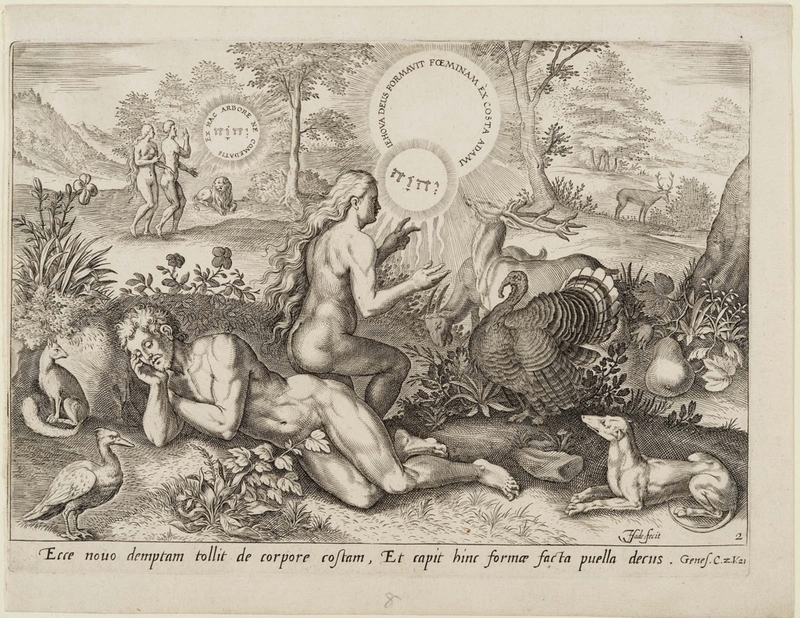 Johannes Sadeler (Netherlandish, 1550–about 1600), After Crispin van den Broeck (Netherlandish, 1524–1591). Courtesy Museum of Fine Arts, Boston.